How do I use Virgin Atlantic Shops Away? Do I need to join Virgin Atlantic Flying Club to earn miles when I purchase through Virgin Atlantic Shops Away? Yes. As long as you're a Virgin Atlantic Flying Club member and have logged in and clicked on the retailer site from the Virgin Atlantic Shops Away site, you can earn miles. Can I purchase from Virgin Atlantic Shops Away if I am not a Flying Club member? How do I start shopping and earning? 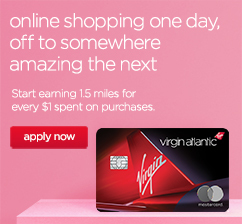 Once on the Shops Away site http://shop.virgin-atlantic.com/ you can choose a retailer you want to shop with and click the 'Shop Now' button to be taken to the retailer's site. You will need to do this every time in order for us to track your miles. You must enable your Internet browser cookies to be sure your miles are awarded to your Account. Is it more expensive to shop via Virgin Atlantic Shops Away site? No you will not spend any more by using our site – and you'll get the benefit of earning miles! It's the same price as shopping directly with the retailers (so you won't miss out on any of their special offers); however by using our site you can earn miles on every purchase (excluding the purchase of gift vouchers, taxes, VAT and/or delivery charges). And our service is totally free! If I am a member of a loyalty scheme, e.g. American Golf loyalty card, and go from http://shop.virgin-atlantic.com/ to American Golf and then log-in as a member, will I still get miles? Yes, you will still get your miles but we would advise that you don't purchase any items if you have previously saved them to your basket – this could affect receiving your miles. It's best to start your shopping basket from scratch. I signed into my Flying Club account and made purchases via Virgin Atlantic Shops Away site, but my purchases aren't showing up in my Account - what's going on? It takes up to 5 working days for a purchase to display as 'Pending'. It may be that the web browser used at the time of purchase had cookies disabled. Cookies allow us to track your purchase - without them there's no way for the system to allocate miles to your Account. Read more about cookies. If you'd like help figuring out what's happened, contact us. My cookies are enabled but my purchases still aren't showing up in my Account? Make sure you log in your Flying Club account via the Shops Away partner page on Virgin Atlantic.com and click on the 'Shop Now' button to go the Shops Away site. Complete your purchase online, all in one session. If you decide after check out that you want to purchase something else, close the retailer site window and start the process again from the Virgin Atlantic Shops Away site. Don't retrieve previously-saved items in your shopping cart; start completely from scratch. If you're buying insurance, make sure you start from a completely new quote; don't retrieve a saved one or use a renewal offer if you're already a policy-holder. Don't click on another banner or website promoting the retailer, or retailer's own eNewsletter before you complete your transaction. If you must visit another site before completing your purchase, please use a different browser to do so. Interrupting the browser session that started from Virgin Atlantic Shops Away can affect tracking. Don't use "refer a friend" programs, again this changes the referrer. Telephoning or going to the physical store of the retailer to complete or modify your order will likely over-ride the Virgin Atlantic Shops Away referral (and therefore your miles). Increasingly some advert blocking software programs prevent the special tracking codes we need to track your purchases, please disable your program before using Virgin Atlantic Shops Away. Don't use a voucher code that is not provided on the Shops Away site. Why have my miles been cancelled? I forgot to Login before buying something. Can I still have my miles? Sorry no, we're unable to retrospectively allocate miles. The next time you shop, always visit the Retailer's website via Virgin Atlantic Shops Away so that cookies can track your visit and we can allocate miles. Are my miles immediately credited to my Account? When you buy something from a retailer, the transaction will appear in your Virgin Atlantic Shops Away Transaction History as 'Pending' within 5 working days. We'll confirm the transaction with the Retailer before updating the transaction status to 'Approved'. This takes up to 45 days (or 90 to 120 days after you've completed your stay for hotel or travel bookings) but in some cases it can take longer and is subject to the Retailer's Terms & Conditions. Once 'Approved' the miles will be credited to your account. If you'd like help please contact us. How do I know how many miles I'll earn? Virgin Atlantic Shops Away will clearly outline how many miles you'll earn. In most cases, this will be expressed as a number of miles earned per £1/USD$1 spent at the retailer. If a retailer is offering 2 miles per £1/USD$1 spent, and your transaction total is £50/USD$50 (excluding VAT and shipping), you can expect to receive 100 miles. In another example, you may not earn miles per £1/USD$1 spent, but rather a certain number of miles for a single purchase, or by registering for a service with that retailer. In this instance, you'll receive miles for that one action, but not for subsequent actions or purchases on that retailer's site. Will I earn miles for postage/handling or tax included in my transaction? Miles are not calculated on postage/handling or tax. Can I see my Shops Away miles for previous shopping transactions ? You can see all your transactions whether they are 'Pending', 'Approved' or 'Cancelled' within your Transaction History. Why do I earn more miles with some Retailers than with others? It's the Retailers who decide the level of miles given for shopping with them. Why have I earned more or less miles with the same Retailer? Miles rates can go up or down, but the current rate is always displayed on this site so remember to look at the current rate to know what to expect. There's an online shop I visit frequently, but it's not featured on the of Virgin Atlantic Shops Away site. How can I get it added? We're constantly adding and looking for new Retailers, so if you know of a great online service or shop that you'd like to see added to our growing list, please get in touch. What happens if I cancel a purchase I've made or want a refund? You can cancel purchases and get a refund in the usual way that you would do direct with the retailer. However, you will not earn miles for any cancelled or refunded sales. I was interested in a Retailer who is no longer listed, can you tell me why? From time to time Retailers may decide they no longer wish to participate in Virgin Atlantic Shops Away. When this happens, we bid them a fond farewell and remove them from our listings. Can I use my miles to purchase products directly from Virgin Atlantic Shops Away? What are Shops Away instore offers? To collect Flying Club miles with a instore retailer, simply login to your Flying Club account, click on instore and then use the ‘register card’ functionality to register up to 10 of your payment cards, which will be registered to your Flying Club account. You only need to do this once and you can add or delete cards at any time. You will be able to see which retailers are participating and what their current offers are on the Flying Club website. Then just use one of your registered payment cards for a qualifying purchase and we will do the rest. Please allow up to 24 hours for your card(s) to register before making your first purchase using that card. We use your registered payment cards to track your spend in participating retailers to determine whether you are eligible to earn Flying Club miles. This avoids you needing to show a coupon, voucher or your or providing your Flying Club membership number to the retailer. How do I register cards? Once logged in to your Flying Club account, using the register card function you will be able to register up to 10 payment cards in your Flying Club account. Which cards can I use to collect Flying Club instore offers? You will be able to register UK issued credit and debit cards bearing the Visa, American Express, MasterCard or Maestro symbols. Some instore offers may only be available on specific card types and these will be shown within the offer conditions. How long after registering my cards will they become active for Flying Club instore offers? It will take up to 24 hours for a payment card registered on the Flying Club site to be registered to your Flying Club account. How do I know which Flying Club instore offers are available? The participating retailers and current offers will change from time-to-time and can vary by individual. So we suggest you regularly login to Shops Away to see which offers are currently available to you. How can I add or remove a card? Using the 'edit cards' function on the website, you can add, amend or delete the payment cards that are registered to your Flying Club account. You can have a maximum of 10 cards registered at any time. When should I see Flying Club miles earned through instore retailers, in my account? Typically, a qualifying instore transaction will show in your Flying Club Shops Away account as 'pending miles’ within 7 days of the transaction. It will then take up to a further 45 days for the miles you have earned to move from 'pending' to 'approved' and show in your Flying Club account. Why have the Flying Club miles I have earned through instore offers, not appeared in my account? Flying Club Miles collected through instore offers may take up to 52 days after the date of your purchase to appear in your Flying Club account although they should show as ‘pending miles’ in your Shops Away account within 7 days of purchase. If you returned an item and received a refund, the miles collected will be removed from your Flying Club account. To collect miles for instore offers, you must first have registered the payment card that you used to make the purchase, up to 24 hours prior to purchase. You might not earn Flying Club miles if the same payment card is registered with another ‘card-linked offer’ programme. To avoid this, ensure that you delete or remove the card from any other ‘card linked offer’ programmes and re-register the same payment card again with Shops Away instore. If you can't see your miles in your account 52 days after your purchase, please complete the 'Missing Miles’ form by logging in and clicking the Missing Miles link. It may also be necessary for you to provide a scanned copy of your store receipt. What is the Shops Away Mile Finder? The Shops Away Mile Finder is an application that sits within your web browser and helps alert you to Flying Club earning opportunities when you are visiting participating Shops Away retailer websites. The Mile Finder application is safe and free to download. How does the Shops Away Mile Finder work? After downloading and installing the Mile Finder following the instructions from the Download page (http://shop.virgin-atlantic.com/toolbar/download), the application will alert you on the Miles earning opportunities available to you when you directly visit a participating retailer site using the browser you have the application installed on. The Mile Finder will guide you through the necessary process to ensure tracking of your activity is set and to ensure you are earning miles for any approved transactions you then make within that visit. Do all Shops Away retailers participate in the Mile Finder? No, not every Shops Away retail partner will participate and we are working regularly with retailers to manage their inclusion and status within the application. We would strongly recommend that you always visit Shops Away prior to visiting any retailer site to ensure your transaction activity is tracked. Is any personal or payment information held within the Mile Finder? No, the Mile Finder application does not capture, store, or transmit any personal or payment information. When will I get my miles if use the Mile Finder? The tracking and awarding of your miles for transactions made after interacting with the Mile Finder application will occur in exactly the same way as any other transaction through Shops Away. Please see relevant sections for detail on the approval process and timeline. Do I have to be logged into Shops Away to download the Mile Finder? Yes, you will need to be logged in to download the toolbar in the first instance. Will the Mile Finder install spyware, adware or malware on my computer? No. The Shops Away Mile Finder is free from spyware, adware and malware – the sole purpose of the application is to alert you to relevant Shops Away earning opportunities with participating retailers only. What operating systems and browsers is the Mile Finder compatible with? The Mile Finder works with Internet Explorer, Firefox, Google Chrome, Safari and Opera on Windows and Macintosh operating systems. We will endeavour to update the Mile Finder to be compatible with the latest releases of browser updates as soon as possible – however, please always check the download page for currently supported versions of your chosen browser. Do I have to pay to download and use the Shops Away Mile Finder? No. The Mile Finder is 100% free to download and install. I already have a Shops Away Mile Finder, but I'd like to install this one too, can I have both? You will only ever need one version for your chosen browser and this should be the current version that is available for download. We would recommend removing any other versions and installing only this one. I have a question about downloading/installing the Shops Away Mile Finder? Please check out our step-by-step Installation Guide for further assistance. Can I uninstall the Mile Finder? Please follow the instructions within your browser to remove the Mile Finder. When will I receive my Miles Finder download bonus? 250 Bonus miles will be added to your Flying Club account up to 48 hours after downloading. If you don’t see your Bonus Miles, please complete the claim form here using the merchant name 'Mile Finder'. Will I be contacted by any of your Retailers? Virgin Atlantic Shops Away will not share any personal information about you with our Retailers. Please note though that when you click a 'Shop Now' link to a Retailer, you will leave Virgin Atlantic Shops Away completely and be subject to that Retailer's Terms & Conditions. If you leave your details with a Retailer, they may contact you. A cookie is a small piece of data used by web servers to help identify web users. Cookies can be turned on and off by you at any time in your web browser menu. Cookies allow us to award your miles for any transactions with Retailers. How are cookies used at Virgin Atlantic Shops Away? How it works is that a piece of code on our Retailers' websites records your unique ID number and transaction, and then passes that back to us. We then use this to match it back to your details so we can allocate miles to your Account. under "Privacy" move the settings slider to "Medium" or lower, hit "Ok."
under "Privacy", select "Accept cookies from sites", hit "Ok."
under the "Security" tab in the "Allow Cookies" section, select "Only sites you navigate to", hit "Ok."
Select "Automatically accept session cookies", hit "Ok."
*If using any other browser, just check out their Help section. What do I do if I forget my sign-in details that I used to join with? How do I update my personal details on my Flying Club account? Login to yourFlying Club account and update your details at https://www.virgin-atlantic.com/en/gb/frequentflyer/youraccount/managefcaccount/index.jsp. Where will Virgin Atlantic Shops Away Retailers deliver to? You will need to check with each individual retailer for full details of their delivery options. To understand how it works please visit our how it works page. How many retailers do you have on your site? We have hundreds of retailers currently on our site covering a vast range of shopping categories and are always adding more!